A couple of weeks into the tournament and it has already been one filled with great incident, adequate controversy, great national moments, and more than one thrilling high-quality match. But it all started with the 3-3 draw between Spain and Portugal. The Spain-Portugal match had everything. Fantastic Spanish possession play, goalkeeping howlers, one moment of individual brilliance in the form of Nacho’s goal and, most of all, Cristiano Ronaldo’s emphatic performance. That clutch free-kick will become one of the iconic moments of this World Cup in the YouTube compilations of the future. It was also an interesting study in contrasts when it came to game management. Consider two metrics here: accurate passes and pass completion rates. Over the entire match, the Spaniards completed 700 passes with an eye-popping success rate of 92%. In contrast, the Portuguese managed just 307 accurate passes at a substantially lower accuracy of 83%. At first glance this seems obvious. Especially to anybody who watched the match. The Spanish played like they always do—keeping the ball, working for space, and slowly picking apart the opposition. The Portuguese, on the other hand, yielded possession, and played a somewhat patient game, trying to route attacks through to their star player upfront. But compare these statistics to previous matches featuring these teams, and you begin to see two different tactical approaches to matches. Consider Spain first. 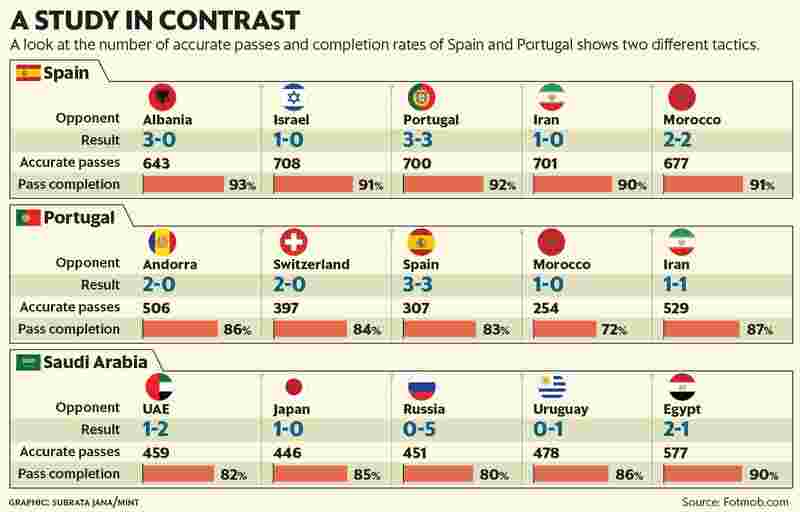 Spain consistently makes around 700 passes at a completion rate of around 92%. (All stats obtained from the Fotmob.com website.) What is more interesting is that they stick to this formula irrespective of the quality of their opponents. Whether it was a World Cup qualifier against Albania in October last year, or a crucial World Cup match against Portugal, Spain sticks to a tactical plan that involves 8-9 accurate passes per minute at very high accuracy. Consider Portugal’s matches, and you get a different picture. Portugal dominated in the qualifier against Andorra, making just over 500 accurate passes at a completion rate of 86%. But in the following qualifier against a much better Switzerland side they made a 100 fewer passes at slightly less accuracy rate. Against Spain last week they were content with just 307 passes at an accuracy of 83%. Unlike Spain, then, Portugal seems to be a team with much greater flexibility when it comes to game management and tactical nous. As opposing teams get weaker and stronger, Portugal is prepared to seize or yield control of the match. Another way to look at this is in terms of quality. Spain, as we have seen, consistently pass at a very high accuracy rate. This could mean that Spain has the confidence and quality to aim to dominate against almost any opposition. Portugal, on the other hand, has to account for its slightly lower ‘quality’—around 85% passing accuracy—with tactical flexibility. Teams at the World Cup, therefore, are faced with an Iberian choice when it comes to tactics at the World Cup. They can either stick to a plan that works, irrespective of the opposition. Or adapt. The worst thing they could do, perhaps, is to stick to a plan that doesn’t work. Consider Saudi Arabia’s last three matches. Despite going through three managers since qualifying for the World Cup, the Saudis seem to stick to a game plan: around 450 passes at an accuracy of around 82%. This was not hard to miss against Russia, when the Saudis seemed to be eager to play out of tight situations with short passes, instead of occasionally thumping the ball away. It didn’t work well for them at all. (The Russians dominated and scored five goals despite making just 251 passes at an accuracy of 73%.) In their second match against Uruguay the Saudis again lost (1-0) despite making 478 passes at an accuracy of 87%. In their final match against Egypt, the Saudis finally found themselves in a situation that allowed them to change their system somewhat. With both teams out of the tournament, both ‘broke’ their system somewhat. Saudi Arabia completed 577 passes at an accuracy of 90%. They won 2-1, but by then it was too late to rescue their world cup campaign. Group F, comprising Germany and South Korea, is going right down to the wire. South Korea can only go through if they win this match and then hope that Mexico beat Sweden. Germany will qualify if they win by two or more goals, or better Sweden’s result, who kick off against Mexico at the same time. If both Germany and Sweden draw, then the team in the higher-scoring game finishes second. If they both draw with the same scoreline, Germany will finish second due to their head-to-head win against Sweden. Toni Kroos will be the player to watch against the South Koreans. Kroos is arguably one of the best midfielders in the world and has proved it with the stoppage-time free kick against Sweden. South Korea will be without their captain Ki Seung-yueng because of an injury, but will look to Son Heung-min for inspiration.